forecasting, and were applied to e.g. metropolitan areas by local environmental or health agencies (Comrie 1997, Corani 2005, Ibarra-Berastegi et al. 2008, Yi and Prybutok 1996). 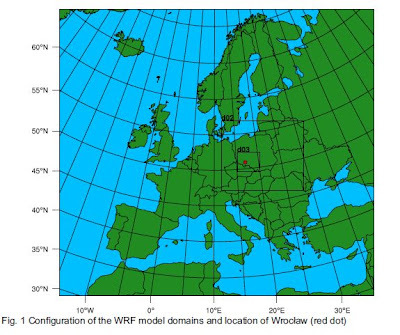 In this paper we present the preliminary results of the O3 forecasting system for the city of Wrocław, SW Poland. Two main tools are used to estimate the hourly O3 for the next 3 and 24 hours – the Weather Research and Forecasting (WRF) mesoscale meteorological model and an artificial neural network (ANN). WRF provides the meteorological variables for the next 3 and 24 hours, and the ANN is then applied to forecast the O3 concentrations. the Fast Artificial Neural Network library and FANN Tool 1.1 interface.